Subject Matter Experts can help save the day - and your training! Subject matter experts (SMEs) are typically brought in to provide support on training projects because of their high level of expertise and in-depth knowledge of the content you're looking to train on. But unfortunately, SMEs can sometimes ONLY be viewed as just a way to get the information needed for the training and nothing more. 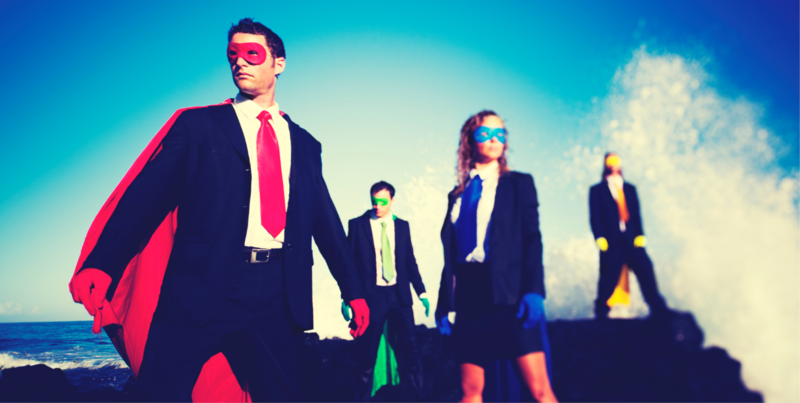 So you may be wondering, just like the attendees, how are superheroes related to SMEs? In their session, Alicia and Liesl discussed that SMEs really are and should be the superheroes of your training; they can help save the day AND save your training from being ineffective! Creating success with SMEs is all about the partnership you cultivate: building the relationship. A SMEs strength lies in the fact that they DON'T KNOW exactly what you know as an eLearning professional. And we want SMEs who bring their PASSION for their content and their EXPERTISE into a project, not try to mirror our passion for design and development. The value of a SME superhero is that they are the experts and they are going to be the ones to bring the content to life and tie in that practical application that every learning solution needs. Use the helpful "Incite Sheet" to guide conversations and set expectations and agreements. Discovery: This is all about finding out what you have and what you still need. Is there legacy content that already exists that needs to be built upon, or is this brand new content where you're truly starting from scratch? If there is already some type of training out there, does the SME have any feedback on how that is currently constructed? Is there anything missing that needs to be included? Pie in the Sky: If the SME could do anything they want for this training, what would be included? You can preface this part by saying what is talked about here won't necessarily turn into the final product word-for-word, but it's nice to get the SMEs thinking about their "ideal" training so you can get a feel for how that can be adapted to fit the needs of the business and the learners. Identifying Sources: Determine how you'll be getting the sources you need to be able to deep dive into the scripting and content. Will the SME you're working with currently be the holder of the content you need, or will it need to come from someone else on the team? Is the information you need contained in documents/PPTs/other source materials somewhere? Or is it more "tribal knowledge" that will require you to set up meetings to record information that can then be used to build out the training? It's good to know where the content is coming from early on in the process so you can hit the ground running with scripting. Housekeeping: Figure out your SMEs schedule early on in the process! Keeping availability in mind will help you in scheduling out timelines and assigning to-dos, and it also shows your SMEs that you will do what you can to ensure their time is used efficiently. You can take this time to figure out if they have any time off coming up to ensure you plan reviews when they will be available. It's also good to find out who THEIR sidekick is, in other words who you should contact when they are out of the office. Communicating Action Steps & Expectations: There is nothing worse than leaving a meeting thinking, "What just happened and what am I supposed to do now??!" What do you need from the SME and what does the SME need from you in order to get the project started? This could include the SME sending along source materials, or you setting up a meeting with the team to talk through scripting out the content and what should be included. These action steps should include due dates instead of just "get it to me when you can." All these aspects that we admire in our superheroes also exist in the superhero-SMEs we interact with every day! So the next time you meet with your SMES, watch closely, listen intently, and keep your eyes to the skies after they leave; you might just see an outline in the sky ... is it a bird, a plane ... or ...? Click here to download your own copy of the Incite Sheet to use during your next SME meeting! Would you like to learn more about working with Subject Matter Experts or eLearning? Fill out the contact information below and we'll connect with you!